'Presented by the Trustees in Recognition of the Heroic Endeavour to Save Human Life to Wilfred Hughes Pontygates (sic) 3rd September 1924'. There had been a tradition in the family that Steve's great-grandfather, Wilfred Hughes of Pontyates, had been involved in a rescue at a local colliery, but little else was known. This discovery and the recent lecture on the subject of coal mining by Llanelli Community Heritage Advisory Panel Member, Phil Cullen, prompted Steve to try to solve the mystery behind this award. Initial searches carried out at various libraries and establishments proved to no avail so he wrote to the 'Carnegie Hero Trust Fund', the body that had originally presented the award. The Trust's reply included photographs from the pages of a beautifully illuminated volume, detailing the 'Roll of Honour' of those who had been awarded the certificate. The date of 3rd September 1924, was a dark day for the village of Ponthenry in the Gwendraeth Valley. It was the day that five colliers were killed in the Ponthenry Colliery, as a result of the occurrence of the phenomenon known as an 'outburst' or 'blower'. This disaster at Ponthenry is fully described in Phil Cullen's book called 'Outburst'. 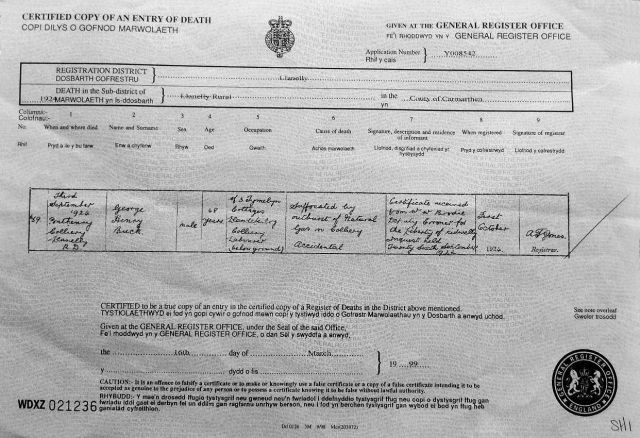 Stanley Morris (single) of Mynyddygarreg, Samuel Evans of Ponthenry (a married man with four children) , George Buck (ref. addendum below), Llandefeliog, all had succumbed to gas poisoning. "he had heard William Henry Evans, the father of the boy tell him to go to the 'parting' to see if there were any empty drams there, the lad went, but almost immediately afterwards the ominous sounds of the gas blower were heard. The father immediately shouted to the boy to come back and ran some distance towards the lad. Father and son were subsequently found by the rescue party lying side by side – the father dead, and the boy seriously gassed." "We should like to pay a tribute of admiration to the men who went down the slant to render assistance to the injured". "Wilfred Hughes, miner, Pontygates (sic); William King, miner, Ponthenry; Rees Charles, miner, Trimsaran; Stephen Charles, miner, Lynydd-y-garreg (sic) (Mynydd-y-garreg); John Morgan, under-manager, Ponthenry; Henry Butterfield, fireman, Ponthenry; Rees Morgan, under-manager, Ponthenry and David Walters, fireman, Ponthenry, on 3rd September 1924, rendered valuable assistance on the occasion of an explosion of gas in the Ponthenry Colliery, Carmarthenshire." Fireman. Brynawe, Ponthenry on the 3rd September 1924, rendered valuable assistance on the occasion of an explosion of gas in the Ponthenry Colliery. Carmarthenshire. Wilfred Hughes, miner, Pontygates (sic); William King, miner, Ponthenry; Rees Charles, miner, Trimsaran; Stephen Charles, miner, Lynydd-y-garreg; John Morgan, under-manager, Ponthenry; Henry Butterfield, fireman, Ponthenry; Rees Morgan, under-manager, Ponthenry and David Walters, fireman, Ponthenry, on 3rd September 1924, rendered valuable assistance on the occasion of an explosion of gas in the Ponthenry Colliery, Carmarthenshire. Although it was recorded in the local newspapers of the time that George Buck was a 'single man', we have recently been informed (May 2016) that he was married in August 1913 to Emily Green, a spinster from Portsmouth. We would like to thank Catherine O'Brien, his great-granddaughter, for bringing this information to our attention.